"You only posess what cannot be lost in a shipwreck." 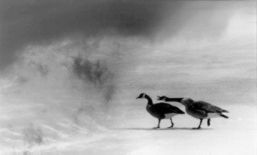 This photograph is actually a composite image of a photo I took of two geese on a frozen lake and a photo of some clouds. Both pictures were taken with a Mamiya/Sekor SLR using Black & White 35mm film. The compositing and developement was done in the darkroom using dodging/burning techniques as well as planned timed exposures. To get the photo of the geese, I was bicycling one winter and decided to jump a fence and meet some animals. I went through a good amount of high contrast film to produce this image. 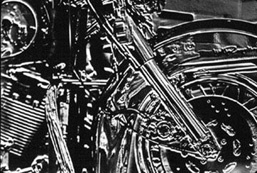 First, I took a photograph of this 1995 model red Heritage Softail Harley Davidson, decked out with alot of chrome, with my old Mamiya Sekor SLR. Then, years later, I thought I'd reprint the negative with some creative darkroom techniques. So I made an 8x10 high contrast negative and an 8x10 positive onto film. Then I offset the two, and contact printed the result on film. Then I simply contact printed the resulting film sheet onto black and white photographic paper to produce the image seen here. I also did a version of this on hand coated cyanatype paper. 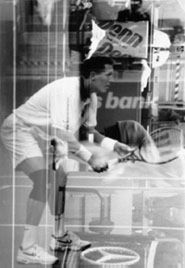 This black and white photograph was taken at a Tennis Doubles tournament in 1996. The double exposure was created with a Nikon 6006 in camera, which is not supposed to be possible. This image is actually a photogram. No film was harmed during the production of this photograph. 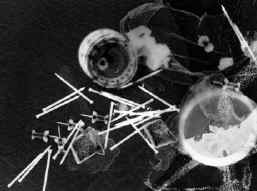 Photograms involve using a light source to expose silver geletin photographic paper while certain objects placed on the paper obstruct and refract the path of the light, thus varying the intensity of the exposure.